I hope you all forgave me as soon as I uploaded my last post, but if not, then maybe this post will turn the tides in my favour. As a lot of you already know, I've spent more than a month working on my makeup battlestation, and I'm still not finished. I think I win the world record for the longest amount of time spent setting up a vanity. It is mere inches away from being complete, but I'm waiting for a parcel from my friend and soon-to-be blogger Cat from the US, as she bought me a brush set that is going right on the desk. I'm wringing my hands in excitement for the care package because I just cannot wait to see what she has in store for me. I can only hope that Cat loves her care package, I've tried so hard to find more Australian brands and products that don't break the bank. Aesop and Jurlique, why are you so expensive?! I've gotta think of something really amazing for her next parcel because it will be a present for Christmas and her birthday. 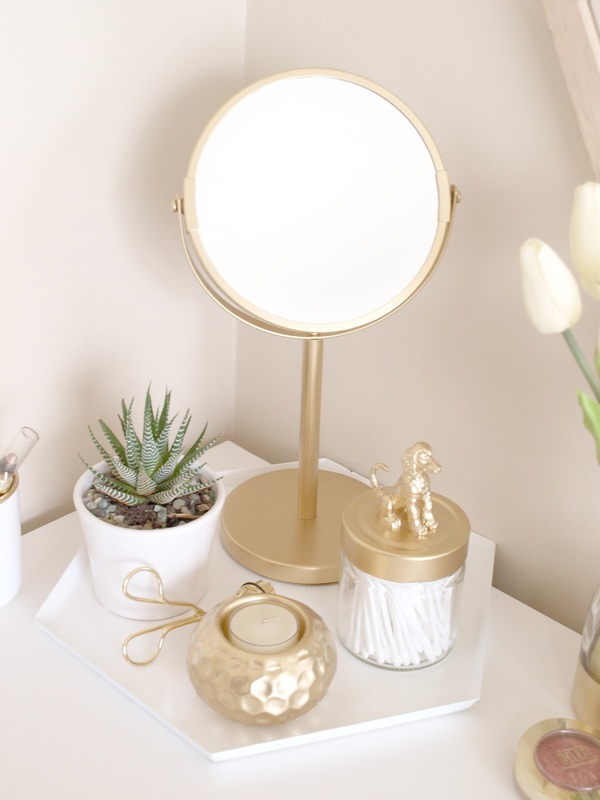 Anyhoo, this post came about when I was desperately trying to find a gold makeup mirror with a magnified mirror on one side, but I couldn't find any anywhere here in Australia. I found one on Amazon but it was $50 in total, half of that being the shipping cost. Being the impatient cheapskate that I am, I threw in the towel and ran to Kmart to pick up a basic silver one. I also stopped by Bunnings to pick up wet and dry sandpapers, both 60 and 320 grit, as well as another can of gold paint as I was running out of my previous one. I ended up only using the 60 grit sandpaper on the mirror, which is very coarse but didn't leave a rough texture to the surface. It got rid of the glossiness and mattified the surface enough to make sure that the primer would grip onto it properly. 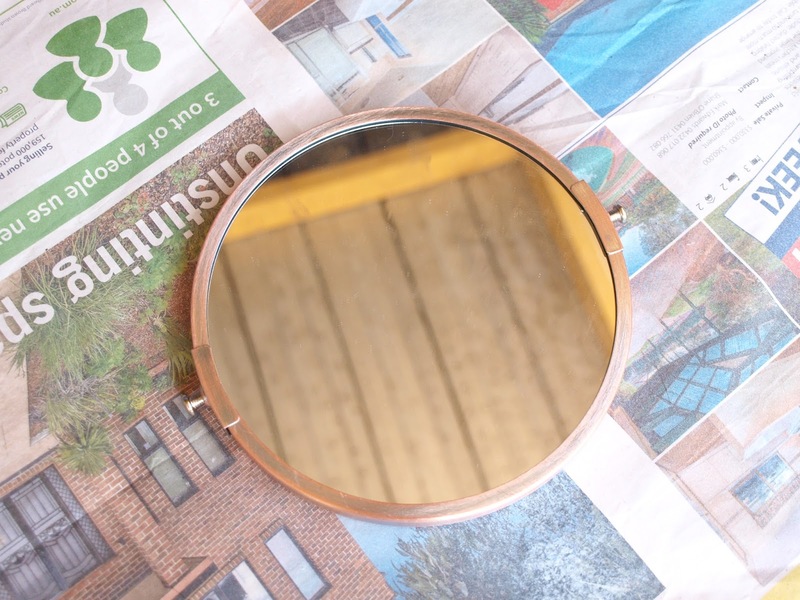 This mirror was made from some copper-based alloy and then plated with something like nickel. 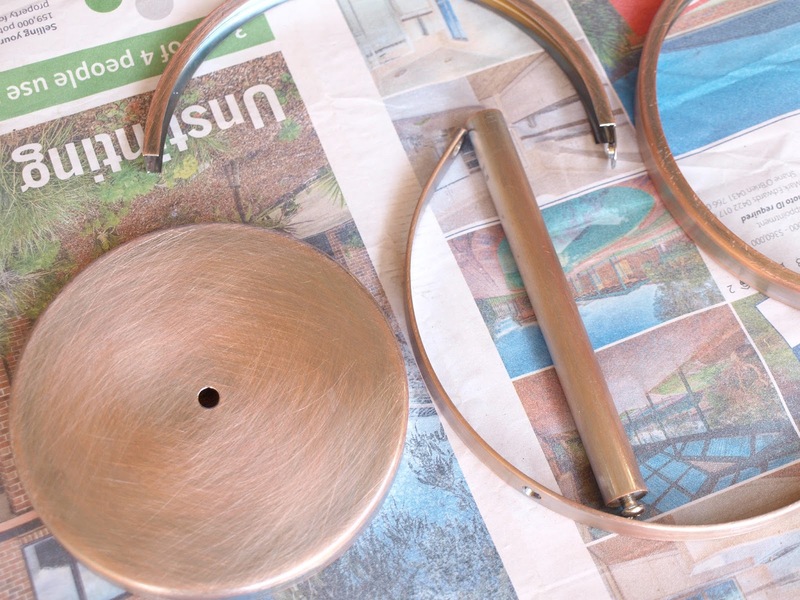 I know nothing about metals, just that it was easy to get to the copper underneath the silver coating. I preferred to use a white undercoat because white is a universal colour and can be used for a lot of projects, hence why I didn't buy a gold-coloured primer. I dismantled the mirror first because it was a lot easier to sand the frame down without worrying about damaging the glass. I made sure to put the screws and the glass in a container for safe-keeping and then I wet-sanded every piece. I rinsed them to get rid of any dust and left them to dry overnight on the draining rack. In the morning, I put the mirror back together and I also attached the stand to the base. I wanted to spray everything with the undercoat first, and then the inner part of what I think is the bracket with a coat of gold paint before putting the whole thing together. This was to make it easier to coat every nook and cranny. 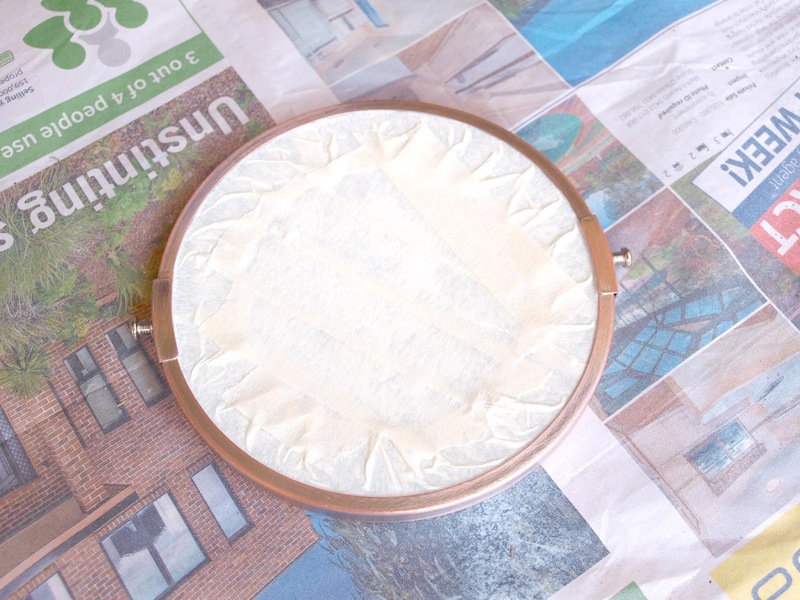 Before spraying, I covered both sides of the mirror with some masking tape and then laid mirror flat on some newspaper. I sprayed one side with the undercoat, and after an hour I flipped it over to coat the other side. While the undercoat on the other side of the mirror dried, I painted the inner part of the bracket in gold. Once everything was dry, I put the whole thing together and started spraying it in gold. 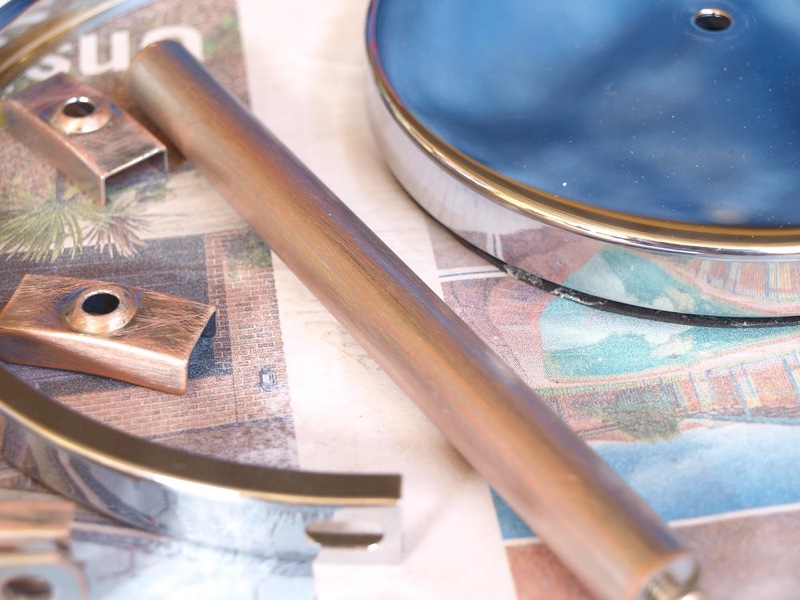 The undercoat, or a primer, is important when it comes to coating metal. 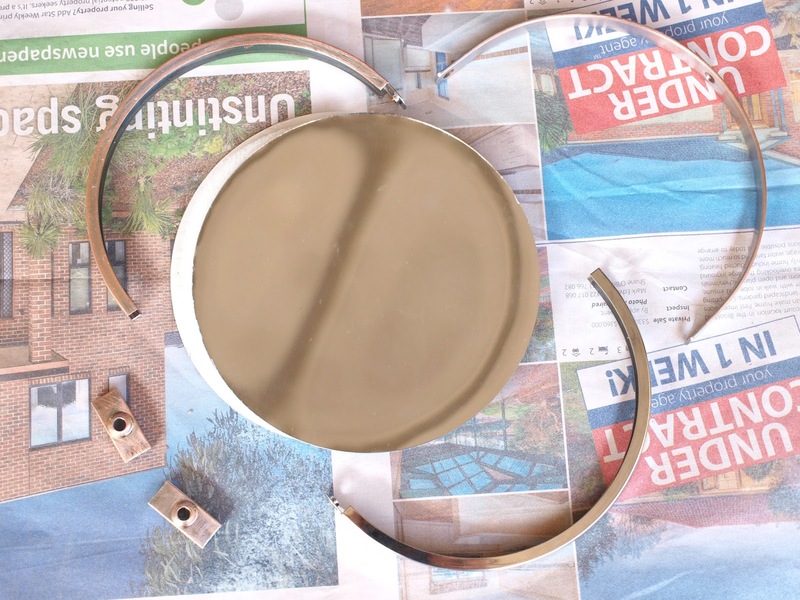 I've been having rotten luck trying to stop paint from chipping on metal items such as the trays from Kmart, so properly sanding it down and giving it a coat of a primer or undercoat really helps the paint to stick to it and prevent it from chipping. I had to do a little more than a few coats of gold paint because it was a slightly windy day, which meant that things like dirt and fibers got stuck in it while it was wet. I had to sand these areas with the very fine grit sandpaper, which left a mark, meaning another coat of paint was required. This is the best way to ensure a smooth professional finish without having dust and fibers mark the surface. I'm super happy with the results and I love how it fits right in on the vanity and matches everything else. It doesn't have a shiny reflective finish like real gold, but considering how difficult it is to find a spray paint that does just that in Australia, I'm happy with the results. After all, this is actually a temporary measure until some store, somewhere, finally releases a gold makeup mirror that doesn't cost a fortune and half. Even then, there's no guarantee I'll go for a new one if it doesn't quite fit in with the overall decor of my vanity. I'm just so happy with the way my vanity looks right now, and I can't wait for the finishing touches to arrive on Monday. 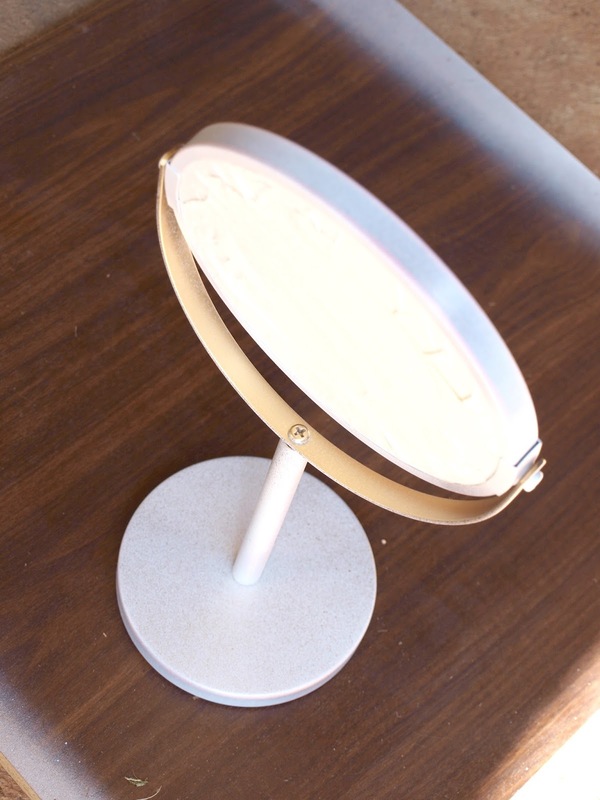 Would you transform a makeup mirror? I think a yellow one would be ace! I love it! I didn't even realize what mirror you were talking about at first. You did an amazing job!!! Thank you so much, Nicole! I'm super pleased with how it turned out too. Hard work pays off, right? Wow - you are super handy. Love how it turned out! This turned out really well! That's a way better option than paying $50 + shipping from amazon... although I'm pretty lazy and I definitely applaud your time and effort for sanding this down and doing multiple coats of paint LOL. I agree, it took a lot of time and effort (waiting for the paint to dry was the worst) but considering how this only cost me about $10-12 to make, it was worth it!